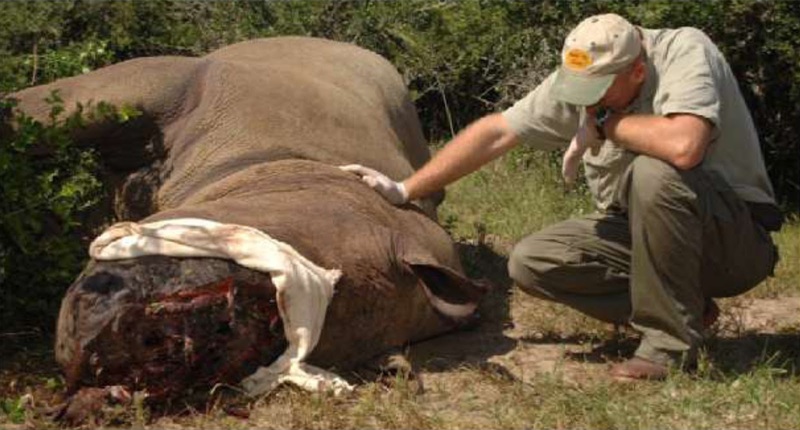 Just last Friday, April 3rd I was asked by the lovely Pippa Jones of Talk Radio Europe to come on her radio show to once again speak about the plight of the rhino and the connection we as humans on this planet have with this beautiful animal. Please take the time and click on the Radio Mp3 Link below to hear the full interview. ( you should be able to forward past the commercials and song to get to the interview) It starts at about 11 minutes in. I hope you find it informative. Pippa has been in producing and presenting her own programmes for 3 years but Talk Radio was always a medium that inspired her. In no small part because she questions and challenges everything, and her show, Radio Jones, on Talk Radio Europe allows her the opportunity to question guests and experts on an array of hard-hitting issues that otherwise she would not find the answers to. Pippa is passionate about challenging complacency and this is what drives her. 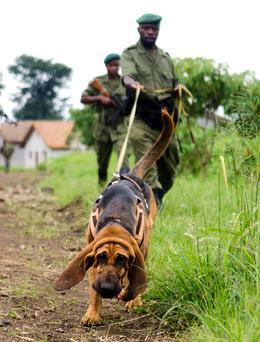 Bloodhound and ranger in Virunga Nat. Park. Nairobi, Kenya – Efforts to conserve Kenya’s dwindling population of rhinos is set to get a significant boost when WWF-Kenya hands over 1,000 microchips and 5 scanners to the Kenya Wildlife Service (KWS) today. The equipment valued at over KES 1.3 million will be instrumental in strengthening active rhino monitoring as well as stockpile audits (of rhino horn). With poachers getting more sophisticated in their approach it is vital that conservation efforts embrace the use of more sophisticated technology to counter the killing of wildlife. 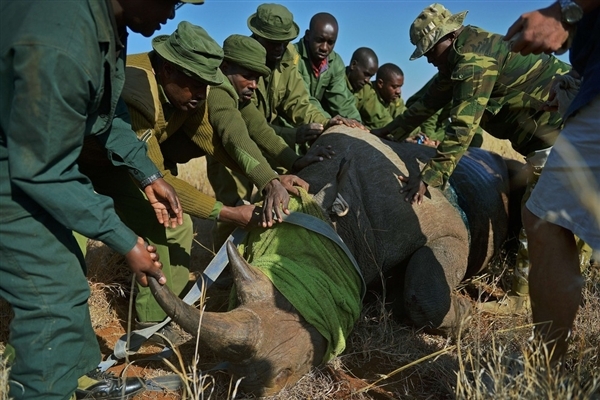 The deployment of specialized rhino horn tracking systems combined with forensic DNA technology will allow for 100% traceability of every rhino horn and live animal within Kenya. This will serve to strengthen rhino monitoring, protect the animals on site and also support anti-trafficking mechanisms nationally and regionally. 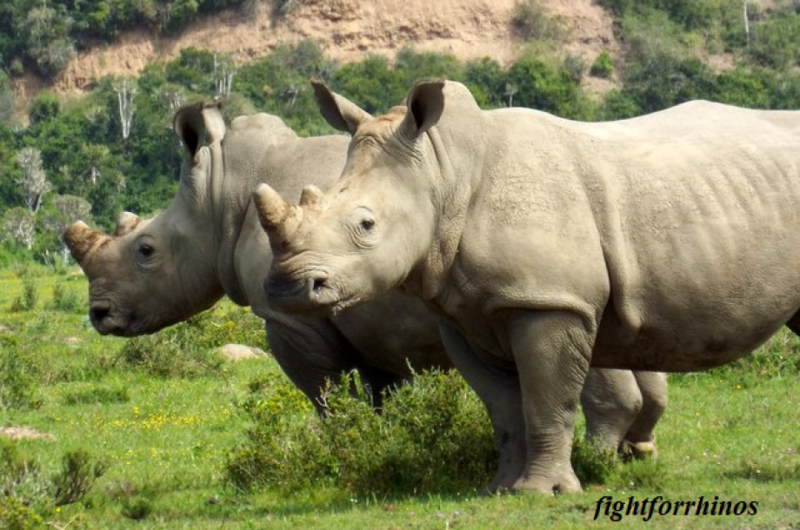 Furthermore, investigators will be able to link any poached case to a recovered or confiscated horn and this forms crucial evidence in court contributing towards the prosecution’s ability to push for sentencing of a suspected rhino criminal. 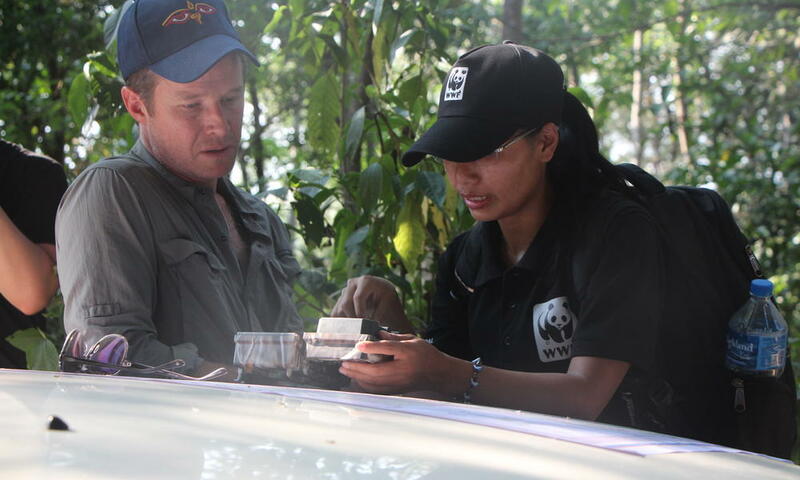 These technologies are now being used internationally in support of criminal justice responses to wildlife crime as well as strengthening inter-agency collaborations (between customs, police, justice, wildlife agencies and defense). 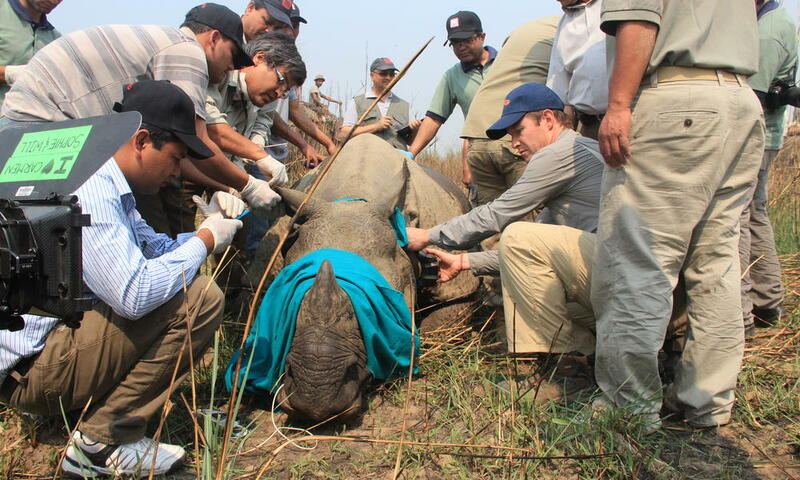 At a continental and worldwide level, these technologies will expose the rhino horn trade chain and facilitate the dismantling of the networks that promote and sustain the International Wildlife Trade (IWT). 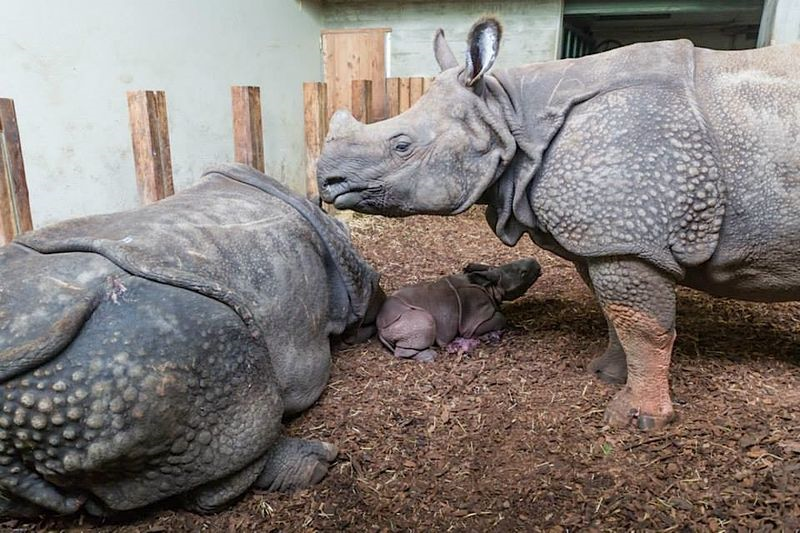 At Zoo Basel in Switzerland, an Indian Rhinoceros gave birth during the night on October 5. The calf, a boy, was given the name Kiran, a Hindi word for ‘sunrise’. Kiran is nursing well and bonding well with his mother, 31-year-old Ellora. On his first day, Kiran weighed 150 pounds (68 kg) and stood just over two feet (66 cm) tall. Kiran’s 3-year-old sister, Henna, was also present for the birth. 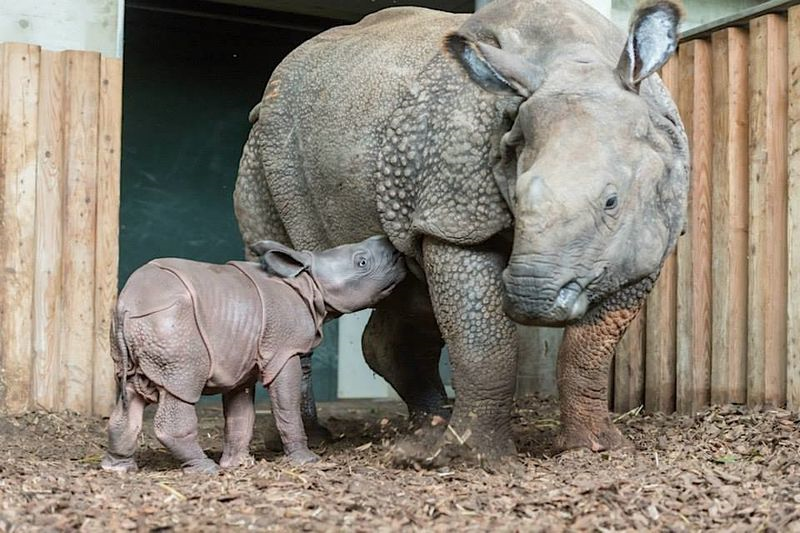 This was the first time in a European zoo that a Rhinoceros birth has taken place in the presence of an older sibling, as it occurs in nature. Usually, older siblings are moved to a different location when a Rhino is giving birth in captivity, to help ensure the safety of the newborn. Henna was a bit uneasy with the unfamiliar new arrangement, but it didn’t take too long for her to adapt. The three now spend most of their time together in the Rhino barn, although Kiran has started to take his first steps outside. Also out-of-the-ordinary, Ellora also had the freedom to chose where she wanted to give within her habitat. The experienced mom made a good decision, chosing the private shelter of the barn. 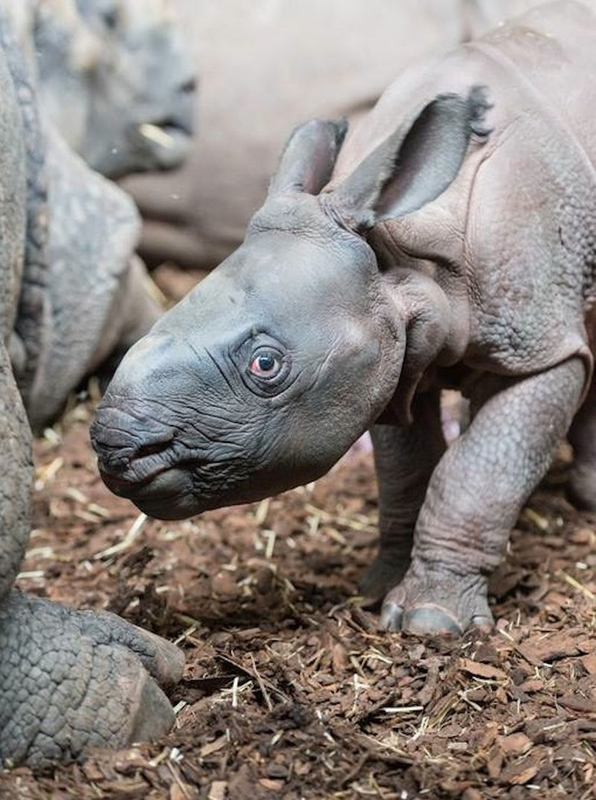 Kiran is Ellora’s eighth calf, and the 34th baby Rhinoceros born at Basel Zoo since 1956 birth of Rudra, the first Rhino ever to be born in a zoo. 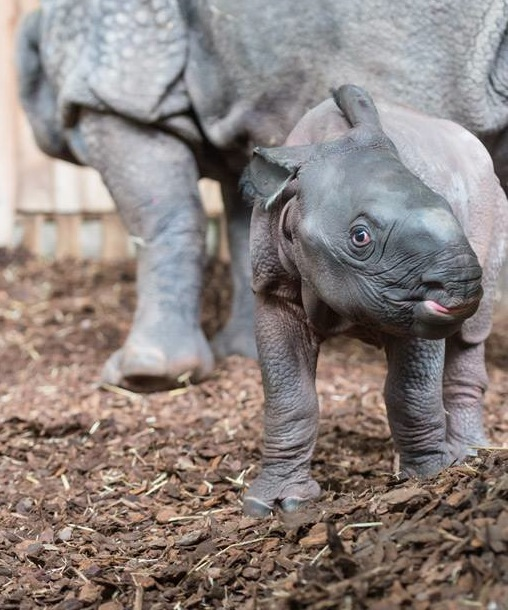 Since 1990, Basel Zoo has coordinated the European Endangered Species Program for Rhinos, an international effort to coordinate the breeding of healthy Rhinos in zoos. The Indian Rhino, also called the Greater One-horned Rhinoceros, lives in the riverine grasslands and forests of India and Nepal. 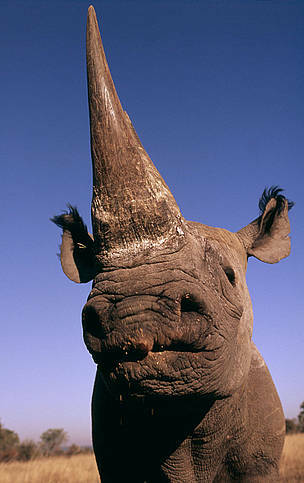 According to the International Union for Conservation of Nature’s Red List, the Indian Rhino is a vulnerable species. 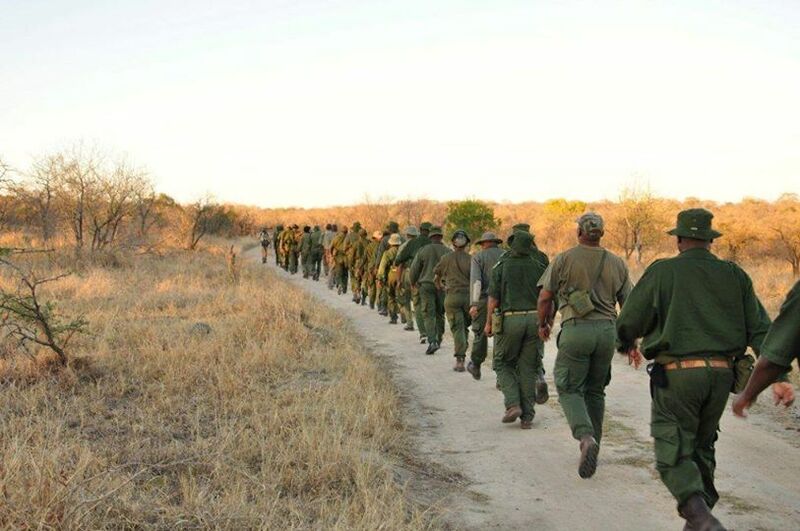 Though strictly protected, Zoo Basel notes that poaching has increased in recent years. The zoo supports the Indian Rhino Vision 2020 project in Assam, India, a site dedicated to the conservation of the species. Elephants are extremely social creatures. They form groups, and sometimes join up with other herds. The females stay together, raising each others young and communicate constantly with one another. Female asian elephants are never alone in the wild. Mali reaching out for companionship. Manilla Zoo, Philippines Mali is the only Asian Elephant in the zoo. 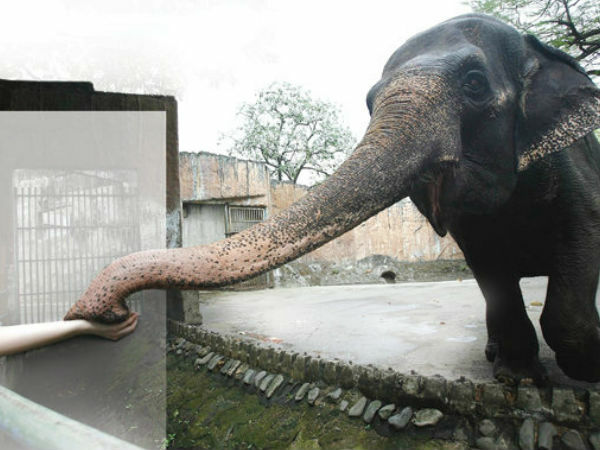 In fact she is the only elephant in captivity in the Philippines. The 38-year-old gentle giant has been an occupant of the zoo since she was taken from her mother at the age of 3, spending all of her life in a concrete enclosure. After capturing the attention of concerned citizens, an animal rights group was contacted and Dr. Mel Richardson, a veterinarian and expert on elephants, was sent to evaluate Mali. 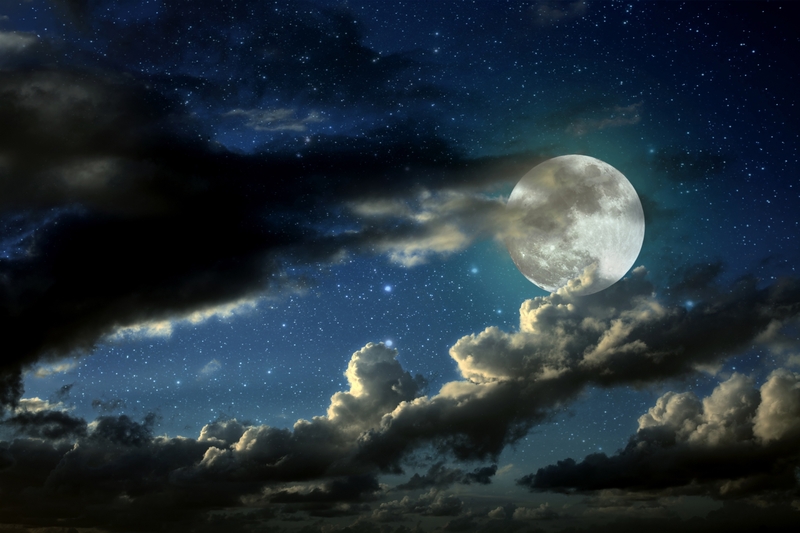 His findings expressed concerns both for her physical and mental health. Mali’s feet (which have only known the feel of concrete) are showing ailments including cracked nails, overgrown cuticles, and cracked pads. Such foot problems are the leading cause of death in captive elephants. The zoos veterinarians admit they do not have the means to properly care for her feet. Mali’s “home” for the last 30 years. There is a place available for Mali at an elephant sanctuary in Thailand. She could feel the grass beneath her tired feet, wrap her trunk around other trunks, greeting other elephants for the first time in her life. 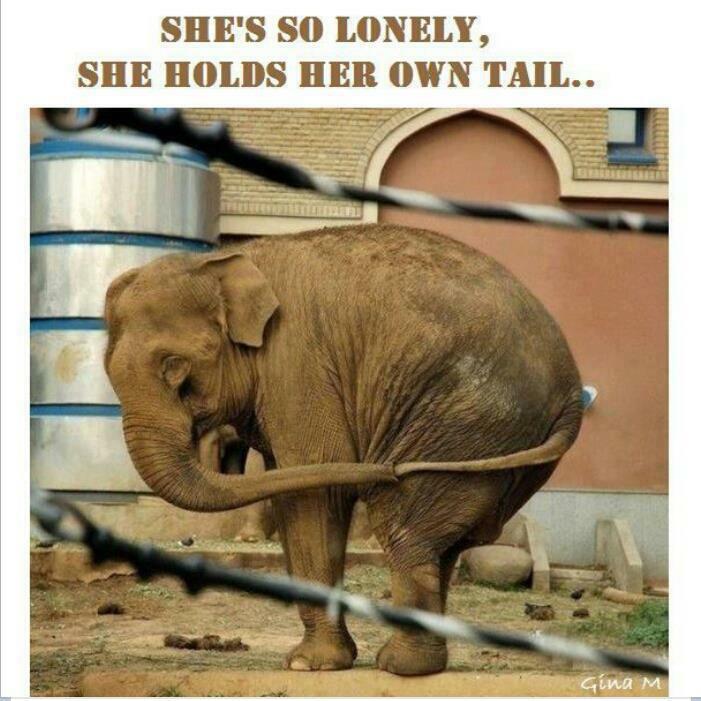 After a lifetime of solitary confinement, isn’t it time she lived as she was meant to? There has been an outpouring of support for this magnificent lady. Everyone from PETA to Dame Daphne Sheldrick has lent a voice to the effort to move her. 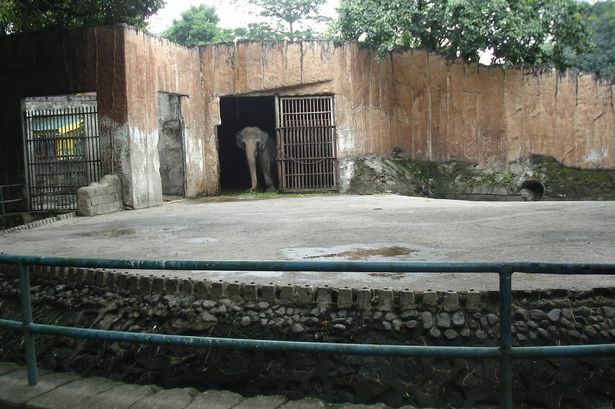 Yet the officials of the Manilla Zoo have resisted, saying she is home and they are her family. There is a place available for Mali at an elephant sanctuary in Thailand. After a lifetime of solitary confinement, Mali could finally feel the grass beneath her feet, wrap her trunk around other trunks, and greet a family for the first time in her life. Please join in the fight to give Mali the life she deserves. Go to Free Mali on facebook. PHOTO NOTE: The name of the Matador in this photo is unknown. 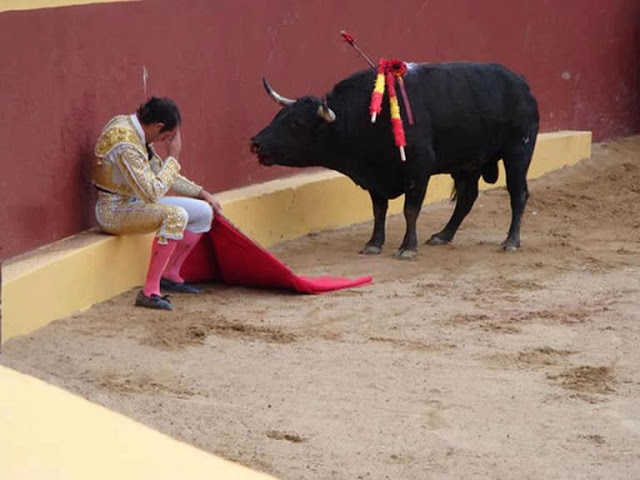 Some say, the Matador’s posture is not one of sadness, but one of defiance to the bull. This post ponders the few Matadors who have choosen to walk away. “And suddenly, I looked at the bull. and he looked at me with this pleading. Nicky’s handler shows him what leaves to eat. On the Lewa Wildlife Conservancy, the rangers keep an eye on a variety of creatures from Grevy’s Zebra to the Black Rhino. 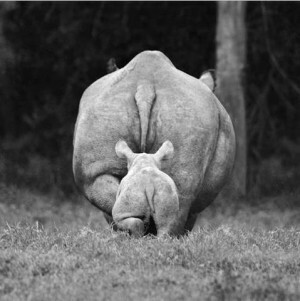 On occasion they observed a mother rhino with her calf in what seemed an odd situation. The baby seemed confused, bumping into things and not staying with his mom. This little rhino was Nicky. He was born blind. It is a congenital condition caused by cataracts. It is correctable, and it is the hope that funds can be raised to bring in a specialist to restore Nicky’s eyesight. 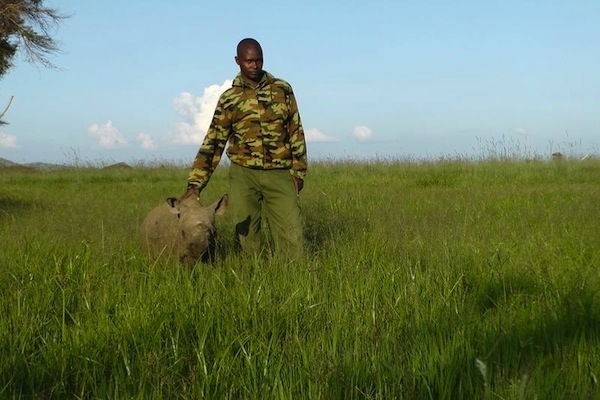 The staff at Lewa felt his safety would surely have been compromised if left in the wild. So he was taken from his mom. 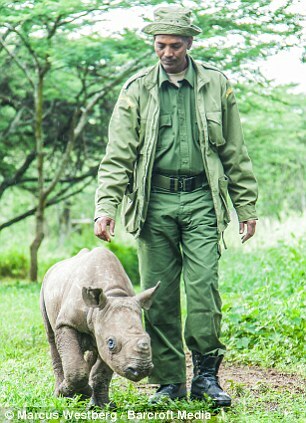 He now lives at the family home of Mike Watson, the CEO at Lewa. He is given round the clock care from two handlers, he is never left alone. His new boma (enclosure) has a padded play area for his safety. 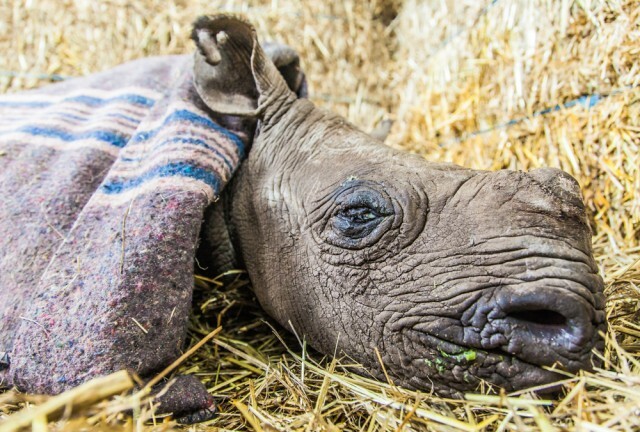 Nicky runs, plays, takes baths, rolls in the mud, goes for walks, and naps like any other young rhino. Due to human contact and his condition, it is unlikely Nicky will ever return to the wild. However, he is considered an ambassador for the black rhino species, and hopefully his story can help to bring attention to the plight of his kind. Nicky’s blanket gives him warmth and comfort like he would get from his mom in the wild. If it falls off at night, he wakes his handler by jumping on him and squealing until it’s put back on. to how many are dead. Dr. William Fowlds had been a part of Geza’s life since birth , and sadly he was there for Geza’s final breath as well. This is a tough one to watch, but a friend posted this and asked for everyone to view it. For Geza, see what poaching did to him. See what he endured, share and show others the cruel and crucial reality our rhinos face. Time’s running out.